Amenhotep IV - better known as Akhenaten, the new name he took early on in his reign - ushered in a revolutionary period in Egyptian history. The Amarna Interlude, as it is often called, saw the removal of the seat of government to a short-lived new capital city, Akhetaten (modern el-Amarna), the introduction of a new art style, and the elevation of the cult of the sun disc, the Aten, to pre-eminent status in Egyptian religion. This last heresy in particular was to bring down on Akhenaten and his immediate successors the opprobrium of later kings. The young prince was at least the second son of Amenhotep III by his chief wife, Tiy: an elder brother, prince Tuthmosis, had died prematurely (strangely, a whip bearing his name was found in Tutankhamun's tomb). There is some controversy over whether or not the old king took his son into partnership on the throne in a co-regency - there are quite strong arguments both for and against. A point in favour of a co-regency is the appearance during the latter years of Amenhotep Ill's reign of artistic styles that are subsequently seen as part of the 'revolutionary' Amarna art introduced by Akhenaten; on the other hand, both 'traditional' and 'revolutionary' art styles could easily have coexisted during the early years of Akhenaten's reign. At any rate, if there had been a coregency, it would not have been for longer than the short period before the new king assumed his preferred name of Akhenaten ('Servant of the Aten') in Year 5. The beginning of Akhenaten's reign marked no great discontinuity with that of his predecessors. Not only was he crowned at Karnak (temple of the god Amun) but, like his father, he married a lady of non-royal blood, Nefertiti, the daughter of the vizier Ay. Ay seems to have been a brother of Queen Tiy (Anen was another, p. 115) and a son of Yuya and Tuya. Nefertiti's mother is not known; she may have died in childbirth or shortly afterwards, since Nefertiti seems to have been brought up by another wife of Ay named Tey, who would then be her stepmother. Akhenaten - Male Or Female ? When the tomb of Akhenaten was rediscovered at Amarna in the early 1880s, portraits of the royal couple were at first thought to represent two females, by virtue of Akhenaten’s curious androgynous shape. One explanation for the king's unusual figure was that he suffered from a tumour of the pituitary gland, resulting in what is known as Frohlich's Syndrome. Certain well- known effects of this disorder seem to be very evident in representations of Akhenaten: skull malformation; a lantern-like jaw; the head looking over-heavy on an elongated neck; excessive fat in areas that are more indicative of the female form, e.g. around the thighs, buttocks and breasts; and spindly legs. 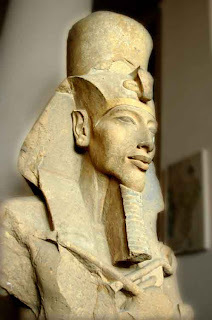 A side- effect of this condition, however, is infertility, and critics have pointed out that Akhenaten would have been unable to father the six daughters with whom he is so frequently shown; on the other hand, he could have been struck by the illness at a later stage in his life.